Ticks pass diseases on to other animal species, and there are many diseases that ticks can carry and pass on to humans. In Montana, tick season lasts from early spring until about mid-July. Ticks like to crawl up on low vegetation and wait for people or animals to brush up against them. Ticks become aroused by the odor and breathing of any nearby host and transfer to humans or animals by stretching their legs toward the host. Ticks do not fly or jump but crawl slowly. Ticks seldom attach to hosts for several hours after contact. In Montana, tick season lasts from the onset of warmer weather in the spring until about mid-July when warmer weather and low relative humidity cause the ticks to become inactive. Rocky Mountain spotted fever is a serious, generalized infection that is usually spread to people by the bite of infected ticks. The disease gets its name from the Rocky Mountain area where it was first identified. Rocky Mountain spotted fever is found throughout the United States, except in Maine, Alaska, and Hawaii. Despite the name, few cases are reported from the Rocky Mountain region. Most cases occur in the southeastern United States. Rocky Mountain spotted fever is spread by the American dog tick, the lone-star tick, and the wood tick, all of which like to live in wooded areas and tall, grassy fields. The disease is most common in the spring and summer when these ticks are active, but it can occur anytime during the year when the weather is warm. Rocky Mountain spotted fever is not spread from person to person, except rarely by blood transfusion. Symptoms usually begin 3 to 12 days after a tick bite. Without prompt medical care, kidney failure and shock can lead to death. Rocky Mountain spotted fever must be treated with antibiotics. Many persons with the disease need to be hospitalized. The best way toremove a tick is with fine-pointed tweezers. Grab as closely to the skin as possible and pull straight back, using steady but gentle force. Do not twist the tick, which can cause breakage, leaving part of its body in your skin. Do not squeeze, crush, or puncture the body of the tick because its fluids (saliva, body fluids, gut contents) may contain infectious organisms. Do not crush, prick, or burn the tick, which may cause it to salivate or regurgitate infected fluids. Do not try to smother the tick with products such as petroleum jelly or mineral oil. Ticks can store enough oxygen to complete feeding. Save the tick for identification in case you become ill. This may help your doctor make an accurate diagnosis. Place the tick in a plastic bag and put it in your freezer. Write the date of the bite on a piece of paper with a pencil and place it in the bag. Limiting exposure to ticks is the most effective way to reduce the likelihood of tick bites. Careful inspection and removal of crawling or attached ticks is an important method of preventing tick-borne diseases. It may take several hours of attachment before organisms are transmitted from the tick to the host. contents, increasing the chances of transmitting the pathogen. These methods of tick removal should be avoided. A number of tick removal devices have been marketed, but none are better than a plain set of fine tipped tweezers. Apply repellants to discourage tick attachment. Repellents containing permethrin can be sprayed on boots and clothing, and will last for several days. Repellents containing DEET (n, n-diethyl-m-toluamide) can be applied to the skin, but will last only a few hours before reapplication is necessary. Use DEET with caution on children. Application of large amounts of DEET on children has been associated with adverse reactions. Place the tick in a sealed container or small plastic bag and deposit in the trash. . Do not flush ticks down the toilet because they can easily survive in the water. 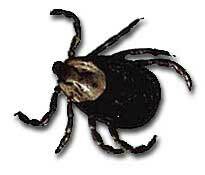 How to remove a tick graphic from the US Food & Drug Administration Tick Information web page.